I wish I’d heard of this book years ago. I think it’s incredibly important, and I wish that it weren’t. Why? It is so easy, as a white man, to think that you understand troubles that others face, to think that you have read and spoken enough about a given issue to feel like you know more or less what’s going on, and why people feel and think the ways that they do. In many cases, you have to actively search out conflicting points of view and other narratives in order to prove otherwise, and why would you bother doing that when you don’t know about them in the first place? Why bother when you think that you’ve already got a good grasp on things? In Lion’s Blood, Steven Barnes takes a fundamentally simple concept and uses it to explore a number of things… it’s quite simply a good and fun (if painful at times) book. But the reason that I think it’s important and wish that it weren’t is that it confronts head on that feeling of complacent surety, the comfort of thinking that you know enough about historical (and modern) problems and don’t have to look deeper to examine your own place, your own implicit beliefs. Lion’s Blood posits a world in which Africa rose to prominence, rather than Europe. 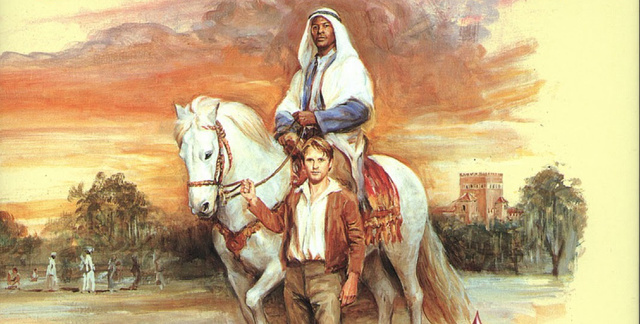 A world in which the slaves working the fields of the New World are white, taken from their tribal villages to work the fields of rich Muslim landowners. Steven Barnes tells a familiar tale here, with a narrative that feels comfortably close to our expectations, but it’s one in which all the cultural and ethnic trappings have been inverted from our standard expectations. And somehow that inversion was enough to shake me out of my “ah yes, this story again” complacency. Better yet, it drove home yet again the violence done to people through the institution of slavery, and (I think) might help to wake some up to the systematic oppression which slavery engenders in a society. And, of course, it tells an excellent story, one well worth reading. Look. I don’t want to ruin this book for you, so I’ll put it like this: this book is sad, tragic, and uplifting; this book is a marvelous adventure story; this book reminds you of why our current society is so screwed up in so many ways, as we deal with the toxic legacies and variably covert attempts to continue the oppressive power struggle at the heart of slavery. I’m deeply impressed. I want my own alternate history to be as good as this book is. P.s. I found Lion’s Blood on this recommended list of books by writers of color. I intend to go back and find more to read, and would suggest that you do the same. This entry was posted in Books and tagged African civilization, alternate history, complacency, Lion's Blood, North America, oppression, slavery, Steven Barnes. Bookmark the permalink.